About 200 million years ago this area was covered by a vast inland sea which caused layers of sediment - mud and sand - to be formed and hardened. Later, forces under the surface pushed these layers upward forming parallel ridges. Although erosion slowly wore those ridges flat, a second upheaval created teh present height and appearance of the land. 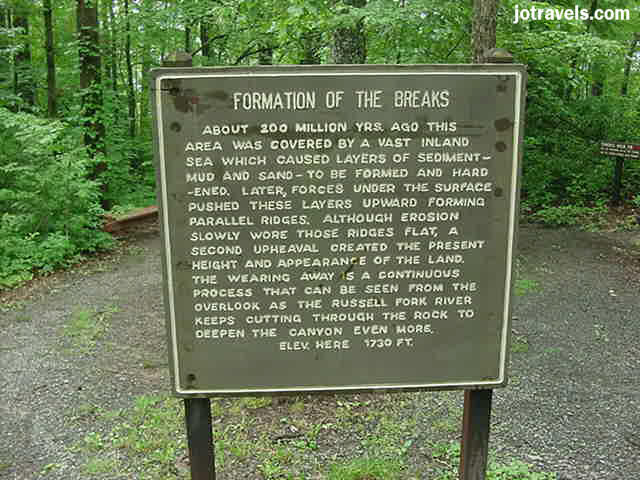 The wearing away is a continuous process that can be seen from the overlook as the Russell Fork River keeps cutting through the rock to deepen the canyon even more.